Yamaha Motor Europe is pleased to announce the six young riders that will compete in the Yamaha R3 bLU cRU Challenge within the 2018 FIM Supersport 300 World Championship. After impressing throughout the season in their respective national R3 Cups, 11 riders were invited to attend the recent Masterclass in Latina, Italy, and the six who will benefit from a Yamaha bLU cRU racing package as they compete on the world stage next season are Luca Bernardi (16) and Alessandro Arcangeli (16) from Italy, Dutchman Dennis Koopman (20), Notis Papapavlou (17) from Greece, French rider Hugo de Cancellis (16) and the 18-year-old Indonesian who has already made his mark in the WorldSSP300 Championship by winning the last race of the season in Jerez as a wildcard, Galang Hendra Pratama. The Yamaha bLU cRU project is a truly unique scheme designed to identify, nurture, and develop the best young riding talent from around the world, providing a clear career path for them to fulfil their dreams on the world stage. Starting in 2015 for off-road riders, the road-racing side of the project began two years later with six riders selected to compete in the 2017 FIM Supersport 300 World Championship as a part of the Yamaha R3 bLU cRU Challenge. The first year of the project saw it deliver on its potential, with 20-year-old Italian Alfonso Coppola winning the challenge and just missing out on the overall championship by one point with all six bLU cRU riders impressing throughout the season. On the 26th-28th of October in Latina, Italy, 11 of the best performing riders in their national R3 Cups got the chance to showcase their potential at the first Yamaha R3 Masterclass to Yamaha Motor Europe’s bLU cRU Racing Manager Alberto Barozzi and bLU cRU Ambassadors David Checa & Niccolò Canepa from the GMT94 Yamaha Official EWC Team, GRT Yamaha Official WorldSSP Team’s Federico Caricasulo and winner of the inaugural Yamaha R3 bLU cRU Challenge, Alfonso Coppola. 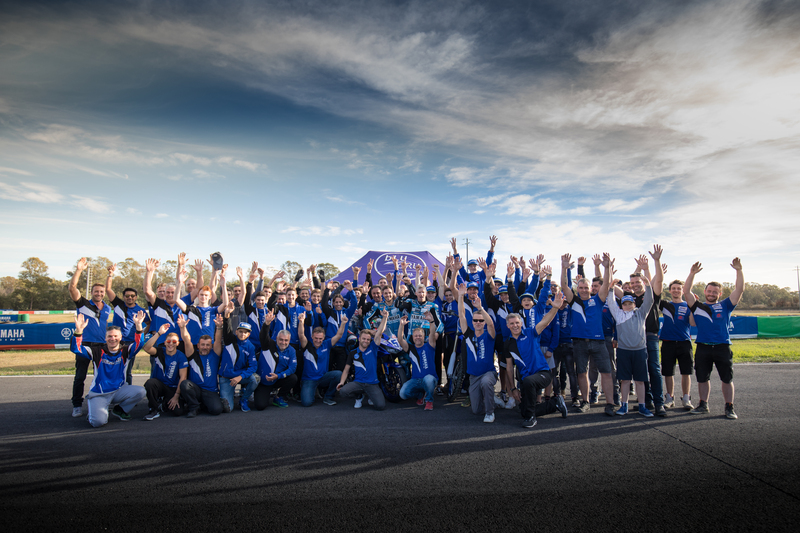 The Masterclass allowed the riders to demonstrate not just their ability on track, but also the qualities that Yamaha look for in a rider away from the track, such as the ability to learn, how they work with their team, their attitude, and much more. From these 11, five were selected to join Hendra in the WorldSSP300 Championship onboard a Yamaha YZF-R3 in 2018 after the Indonesian rider impressed in two wildcard appearances this season, including his stunning victory at the last round in Jerez. These six will benefit from the Yamaha R3 bLU cRU Challenge rider package, dedicated to supporting young riders in the international racing environment. This includes racing kit parts, a race service support at the track, a full paddock clothing kit and much more. The riders will participate in the Yamaha R3 bLU cRU Challenge within the championship, with the top rider at the end of the season moving up the racing pyramid with an official Yamaha supported ride in a higher class the following year, just as the inaugural winner Coppola will do in 2018. It is not the end of the road for those who did not make the cut for the 2018 season, as they will compete in their national R3 Cups next year, with another chance to impress and be invited back to the 2018 Yamaha R3 Masterclass. The first ever Yamaha R3 Masterclass took place alongside the second edition of the Yamaha YZ125 bLU cRU Cup Masterclass, featuring Yamaha MXGP legend Steven Frossard, that searches for the best young off-road riders to take part in the YZ125 bLU cRU Cup, a project that has grown into the most successful feeder program into the European EMX125 Championship – with 15-year-old Estonian Jörgen-Mathias Talviku emerging as the victor. The Yamaha bLU cRU project continues to go from strength to strength in both disciplines as it grows in stature, with the scheme one of the only of its kind in motorcycle racing and, despite being in the early stages, its success is evident for all to see already.